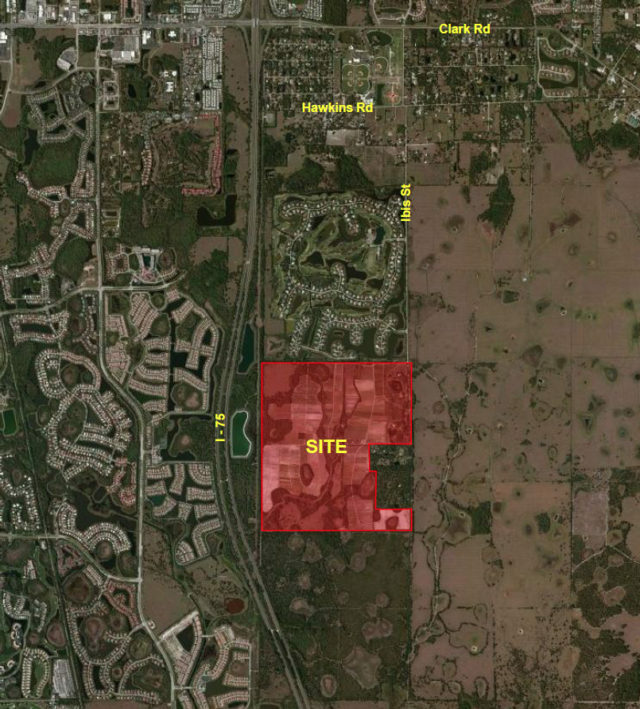 Last year, the Sarasota County Commission rebuffed his attempts to create a Comprehensive Plan amendment for a new type of 2050 Plan community east of Interstate 75. On Jan. 25, developer Pat Neal was back before the board, seeking direction on a number of facets of his latest proposal for a neighborhood he and his team have christened Grand Lake. However, after about 45 minutes of discussion, commissioners made it clear to Neal that they no longer were comfortable with the process. On Oct. 26, 2016, the commissioners voted unanimously to deny the Comprehensive Plan amendment for which Neal had petitioned. One of the main objections — cited by then-Chair Alan Maio — was that Neal should not have sought a reduction in the amount of affordable housing required in a 2050 Plan project. 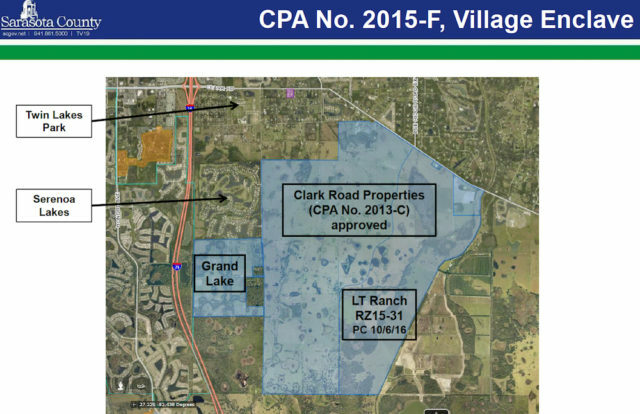 Staff also objected to Neal’s efforts to craft an amendment that would add criteria for a Village Enclave community into the 2050 Plan section of the Comprehensive Plan when the specifications would apply just to Neal’s site east of I-75, south of the Serenoa Lakes community and west of the Clark Road Properties development area. Before Neal even began his Jan. 25 presentation, Chair Caragiulo asked Deputy County Attorney Alan Roddy to explain the process Neal was pursuing that day. Under guidelines established by the county, Roddy said, an applicant could come before the board to talk about facets of a proposal, and the commissioners could provide guidance to staff and the applicant, if they so chose. They were not being asked for an up or down vote on the project, Roddy added. It was the first of numerous apologies he would make through the course of the discussion. He explained — as he had last year — that his Grand Palm community in Venice is the only Sarasota 2050 project that has been constructed thus far and the only one where homes have been sold. Then, in regard to the Grand Lake project, Neal continued, “We wish for ourselves and Sarasota County to avoid any further missteps. … Again, I am sorry for missing so bad on Oct. 26. He and his team can build affordable houses, he pointed out. In fact, they have been selling homes in Manatee County for $172,990, he told the commissioners. During the Oct. 26, 2016 public hearing, county Planner Vivian Roe explained that the county’s 2050 Plan calls for 10% of a project’s houses to be priced at 80% of the region’s annual median income (AMI); another 5% have to be affordable for families making 100% of the AMI. Because of the need to put a deposit down on a home, Roe said, a dwelling unit priced at 80% of AMI would end up costing $268,000. The 100% AMI figure is about $62,000 per year, she noted; 80% of AMI is $49,500 per year for a family of four. 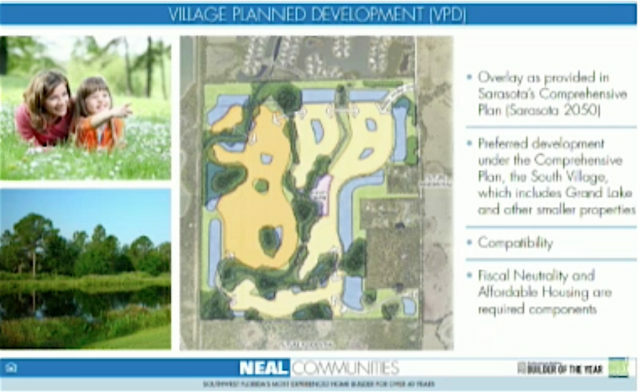 At that time, Neal’s proposed Village Enclave amendment involving the county’s 2050 Plan called for only 10% of such a project’s dwelling units to be considered “community housing,” priced at 100% AMI. “I’m sorry that we missed so bad on Oct. 26,” he repeated on Jan. 25. Commissioner Maio told Neal, “I was rather intense at your last hearing … because I really felt strongly about certain things.” Maio acknowledged that the information Neal had provided to the board about the revised vision for Grand Lake “does include affordable housing, and it does include transfer of development rights.” The latter is another aspect of 2050 policy. Neal again broached the subject of affordable housing, pointing out that prior to the Oct. 26, 2016 hearing, neighbors of the Grand Lake site had objected to the inclusion of less expensive homes. Then Neal reiterated Klepper’s earlier comment: The development team has come to favor the Village plan. Thus, Neal said, he wanted the board’s direction on housing designs and the buffers other than the 500-foot one that would be next to the Serenoa Lakes neighborhood. Hines suggested Neal just work with the adjacent communities on facets of the Grand Lake proposal. Maio added that he felt an “educational process” with the residents would allay their concerns about the types of affordable homes Neal would build at Grand Lake. Hines also pointed out that Palmer Ranch has a variety of housing, and he has not heard complaints about rental apartments next to $800,000 houses in that community. 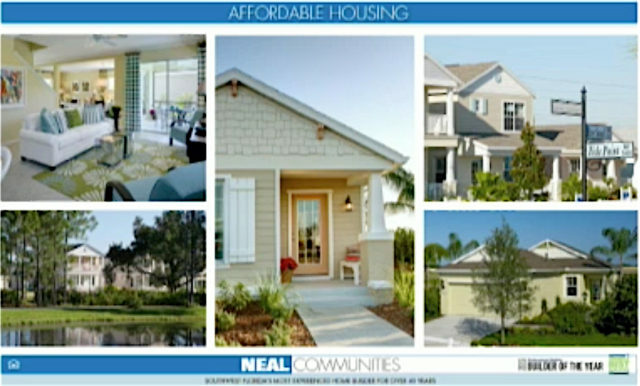 Still, Neal proceeded to show the board slides depicting numerous styles of homes, at various prices. Commissioner Moran said he expected some homes in Grand Lake will be priced higher to compensate for the lower profit margin on others that are less expensive. “What you said is absolutely true,” Neal replied. 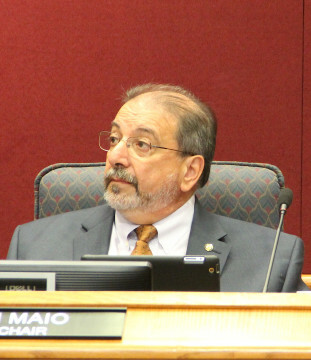 Maio then reprised a comment he made on Oct. 26, 2016 — that teachers, deputies, dental hygienists and people in other professions that do not offer high salaries still need homes they can afford in Sarasota County. “All [of those people] are a valuable piece of the development and will be a valuable piece of the eventual homeowners association. … [Providing affordable housing] is important for us to do,” Maio stressed. Neal continued to ask the board members to indicate which styles of affordable housing they preferred as he showed them slides. “But we’d like to know which house you want,” Neal replied. “I feel like you’re asking us to micromanage your business decisions on your development,” Hines told Neal. Yet, Neal then pressed on with the question of the buffers, saying he would like to reduce them on the sides of the property except the one that adjoins Serenoa Lakes. Otherwise, 500-foot buffers on every side would consume 44% of the total area of the Grand Lake site. 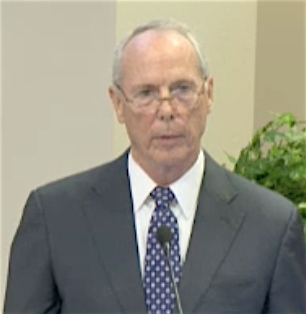 Finally, Hines suggested Neal and the development team members “advocate … to our staff” the points Neal had begun to make to the board about modifying the buffers. “We represent the taxpayers; we represent the neighbors in this discussion,” Moran told Neal, recommending Neal’s team work with the neighbors on such elements of the project design. “They are much closer to the process than we are. By the time Neal stepped away from the podium, the agenda item had taken about 48 minutes — 18 more than county Planner Roe had said she anticipated.